Keiby Citom Manicure Pedicure Set - High Quality, Durable, Portable, Healthy - Lifetime Guarantee. ✔Keiby Citom is a manufacturer of professional manicure set for more than 10 years.We are committed to manufacturing high quality, durable, portable, comfortable, healthy and reliable beauty tools. ✔Each tool of nail kit is manufactured by the careful process of cutting to make sure it can be used more comfortably. ✔Small size of grooming kits makes it portable and lightweight,which is easy to carry,great for travel and daily life! ✔The pedicure set is a great gift for yourself,families and friends! ❤LIFETIME GUARANTEE : Keiby Citom is a leading factory which has specialized in manicure set for more than ten years,so we can offer you HIGH QUALITY products with so favorable price and best service 100% Satisfaction Guarantee and a lifetime replacement. We will refund your money or redeliver a new product if you are not satisfied with for any reason. ❤TRAVEL SIZE : Do you want to own a manicure kit which don't occupy space when you travel? Keiby Citom nail kit is designed with portable size, so it is very convenient to carry, can fit into almost any handbags/shoulderbags, great for travel or at home. ❤SUPERB TECHNOLOGY : This grooming kits are made of 100% heavy duty quality stainless steel, never rusts.It was processed through alternate hot and cold technology to make sure corrosion-resistant,hard and durable. 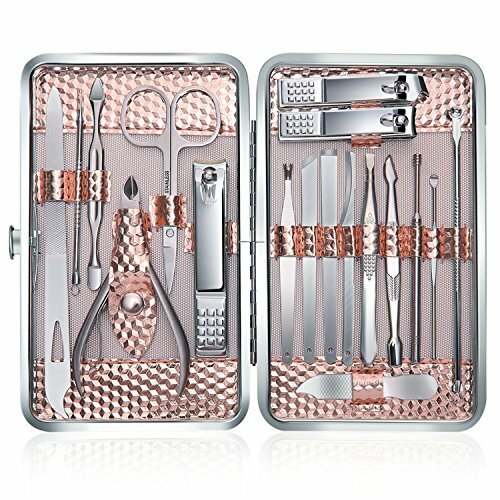 ❤MULTI-FUNCTIONAL : Keiby Citom manicure set 18 in 1 must meet what you need which is include hand care,facial care,foot care. All the tools are sharp and sturdy,so easy to clip nail. ❤EXCELLENT GIFT : Do you want to give an excellent quality gift which is unique to give a surprise for your families and friends? Not only our product's quality , but also its design is also distinctive. The pedicure set comes with a magnificent case,looks rich and royal, so it's a ideal Christmas, anniversary, birthday, marriage gift.